President Cannon did some of the work while serving time in the Utah penitentiary for breaking anti-polygamy laws. The preface in the first and second editions of the book closes with the unique notation: “Utah penitentiary, October 1, 1888.” This has given these editions of the book added desirability among collectors. … The lady who stated that Martin Harris apostatized over a pint of milk or striplings is entirely mistaken as to the identity of the person she accuses. It was stated and was generally believed that Thomas B. Marsh, the senior member of the twelve apostles, and at the time the presiding member, got vexed over a pint of striplings and allowed his passion to get so much the better of him that it finally led to his and his wife’s apostasy in the church, but no such thing as this ever happened with Martin Harris or either of the other witnesses to the Book of Mormon. The trouble with them was, they had endured so much persecution that they finally yielded so far to the spirit of the world as to claim that it was through the persistence of Joseph Smith, the Prophet, in the course marked out for him that persecutions came upon the church, and in this way they fell into the dark, and finally concluded that Joseph was wrong and had fallen and was leading the church astray, while they only were right, a very common condition for apostates. 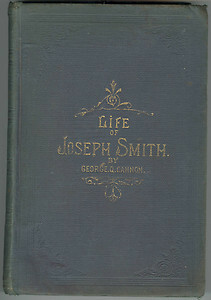 The History of Joseph Smith the Prophet by President George Q. Cannon was to all intents and purposes written by himself. It is true that Frank J. Cannon and perhaps John Q. assisted him in the clerical work of compiling the History, but it all passed through President Cannon’s hands, he dictating it, reviewing and revising it as any author would do. To this statement I am prepared to make affidavit if necessary, for I was with President Cannon during the greater portion of the time which he occupied in getting out this History.